The Balanced Scorecard for City Governance:A Case of Vantaa City. The mechanisms of maintaining recycling company networks: A view on the grass-root level movements. Reinventing Public Service Provision for the Socially-Excluded in the City: The Recent Transformation of Homelessness Support and Different Paths toward Self-dependence for the Homeless in Japan. Housing Support and Community-based Regeneration Strategies for Socially Disadvantaged Areas in Seoul. Housing Aid for the Homeless in Japan and South Korea. Tin Shui Wai New Town: Is it a Matter of Inadequate Provision? Offshore Development of Japanese Software Firms located in Large Metropolitan Areas. Transcend the Dominant Value of the Central District by Situating it in its Historical Geography. 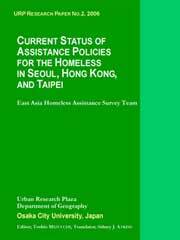 Current Status of Assistance Policies for the Homeless in Seoul, Hong Kong, and Taipei. 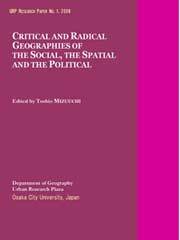 Critical and Radical Geographies of the Social, the Spatial and the Political.